Although consumers have a louder voice than ever before, make no mistake about it, you still own and control your brand. Marketers are still responsible for the brand’s narrative. “The consumer is now in control.” You hear it often. You’ve probably read it in some of my blogs. But is it ultimately true? 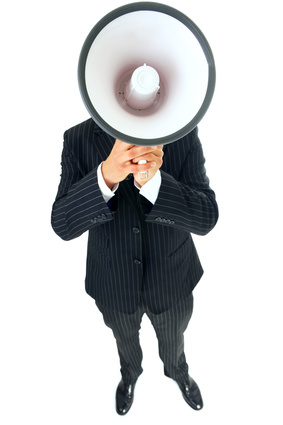 Yes consumers have a louder voice. Yes consumers have new and expanded ways to exert their influence on a brand. But ultimately brands still control themselves. And we must not forget that. The many avenues available to hold brands’ feet to the fire and make them accountable. So it is true, consumers can now influence brands in ways never before available. And that’s probably a good thing. But that doesn’t give them ultimate control. It just requires brand managers and companies to be more responsible and more diligent. True consumers can use DVRs to skip commercials but they have always had that right. No advertiser has ever been able to force a consumer to see or watch or hear it ads. It’s still incumbent on advertisers to attract and hold the attention of consumers to see and hear its messages. Groupon saw and felt the backlash for it’s ill-advised Super Bowl spots. The company was forced to pull the ad and apologize. But is that an example of consumer control or thoughtlessness by the brand? Consumers can now create content for brands. Many brands are soliciting consumer assistance with the content of their advertising. But would anyone just laud the brand building power of consumer directed spots for Doritos and Pepsi in recent years? If consumers now have control of the brand, it’s because brands have given it over to them. And some would point to consumer reaction to Gap’s effort to modernize its logo only to repeal its efforts at the appearance of consumer complaint in social media. But was their backpedaling justified? Only a very some percentage of GAP customers weighed in on the issue. I contend the vast majority of their customers didn’t care. And compare that to the Sci-Fi channel that would endure widespread disapproval when they changed their name to Syfi. But the network did not waver and as result, now the network is setting new levels of viewership and success. True, consumers have more voice. A louder voice. But that is no excuse for a marketer to give up control of its brand. It requires more work, more accountability, more thoughtfulness and more discernment. But the brand is still responsible for itself. It’s a cop-out to concede ultimate control to the consumer. Sure brands should react and respond to the needs and desires of consumers. And letting consumers have input is essential in today’s marketplace (as if it hasn’t been before). Ultimate control however still rests with the brand. For healthcare marketers, as well as all marketers, we still control our brand. Yes it requires more work to shepherd a brand in a more complex media environment, but it is still within our control. Unless we choose to give that control away. But we must not. Now more that ever, we should seek consumer input, listen to their leanings and use that information to have even more control over our brands than we have ever had before.